Perfect, hard to find one story end unit in prime location! Steps to the beach with dedicated beach access and a traffic light to make crossing A1A a breeze! Move right in to this clean, light and bright home with a lovely courtyard in the front and a large porch on the back to enjoy your new beachside home. Low HOA fees and plenty of amenities including pool, tennis courts, shuffleboard, fenced dog run, rv/boat parking($10 per month), and everything that comes with living in this great beachside community! New garage door 2015, New windows 2008, New roof 2008, New A/C 2016, New water heater 2014, newer electric panel. Don't miss this rare find! SchoolsClick map icons below to view information for schools near 275 Kingsway Satellite Beach, FL 32937. Listing provided courtesy of Mark Realty, Inc..
Home for sale at 275 Kingsway Satellite Beach, FL 32937. Description: The home at 275 Kingsway Satellite Beach, FL 32937 with the MLS Number 836376 is currently listed at $217,000 and has been on the Satellite Beach market for 73 days. 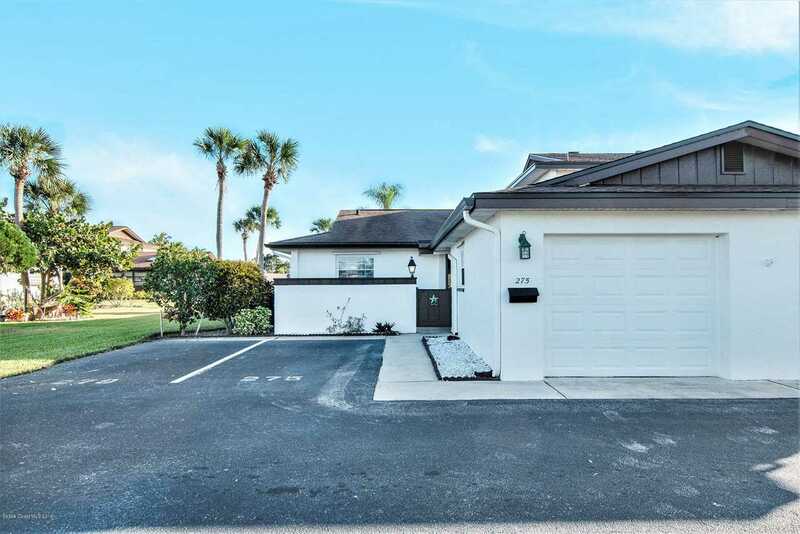 You are viewing the MLS property details of the home for sale at 275 Kingsway Satellite Beach, FL 32937, which is located in the Townhomes Of Satellite Beach subdivision, includes 2 bedrooms and 2 bathrooms, and has approximately 1167 sq.ft. of living area.